Left: Daniel Mowen, taken from the 1905 History of Myersville. Warrenfelz Log House, 9478 Frostown Road, Near Myersville, 1992. From an historical survey of the property: "Built originally about 1850 as a one-story, one-room dwelling, the house was enlarged with a second section of two stories on the south and the roof of the original part raised to provide a second story ... The property also includes a meat house and a frame and stone bank barn, both in deteriorated condition, and two springs in the slope below the house. 'The house was probably built during the period 1850-1870 by a member of the Warrenfeltz family... Located deep within the ravine on the north side of South Mountain at Turner's Gap, [the house] was not shielded from the battle [of South Mountain] by its remote location. Chased by the men of General George Meade's Division, the retreating regiments of General Robert Rodes' Brigade were funneled by the ravine dangerously near the simple log home of the Warrenfeltz family. Rodes' Alabama Brigade of only 1,200 men was stretched across the ravine north of Turner's Gap in a desperate attempt to protect the north approaches to the gap....The Warrenfeltz house would have been directly in the center of the battle." Right: The possible site of George Blessing's skirmish with Confederate raiders. In July 1864, Confederates were in the vicinity of Wolfsville. The Union was present in the area, too. One nearby Union officer was Corporal Christopher Armour Newcomer. After the war, he wrote a memoir titled Cole’s Cavalry, or Three Years in the Saddle in the Shenandoah Valley. In his book, he provides the only unadulterated account of the skirmish between George Blessing, who was awarded the sobriquet “Hero of the Highland” by the press. The battle of Monocacy had been fought. Lieutenant Colonel Vernon and his small force of sixty-five men were familiar with the country. The enemy's Cavalry were overrunning Frederick County in small detachments, gathering up horses from the farmers. Our detachment had come upon several small squads of Rebel Cavalrymen and either captured or dispersed them. On our arrival in the neighborhood of Middletown we were informed by the citizens that an old gentleman, a farmer by the name of George Blessing, living several miles distant, had shot one or more Rebels, and Colonel Vernon started at once with his men for Blessing's farm. As our advance was proceeding up the lane leading to the farmer's house, they were halted by an old gray-haired man, fully sixty-five years of age, who demanded that they should go back, or he would shoot. The old gentleman was partially concealed behind a large tree, with a rifle in his hand. Colonel Vernon called him by name and informed him we were Cole's men and had come to protect him. Mr. Blessing gave us a hearty welcome and said he had mistaken us for the Confederates whom he had exchanged shots with a number of times during the day, and had driven off the enemy not an hour be-fore, who threatened to return and hang him and burn his property. To prove his assertion, he led the way up to his barnyard, where lay a dead Rebel and one in the barn, wounded. The old farmer had some half dozen guns of different patterns; when the roving bands of Confederates approached his house he would warn them off, they would fire upon him, and this old patriot stood his ground. He would do the shooting whilst his small grandson would load the pieces. Our command remained at the farm house overnight and the "Johnnie Rebs" failed to put in an appearance; they would have received a warm reception If they had returned. Our men buried the dead soldier and left the wounded prisoner in the hands of his captor, who promised to have him properly taken care of. On the following morning we made an early start in the direction of Frederick, picking up an occasional straggler. The story of George Blessing's bravery against the Confederate raiders would be embellished by the press, and even moreso, thanks in part to his niece, Nellie Blessing Eyster, a writer whose highly embroidered short story about the skirmish appeared in California Ladies Magazine’s August 1903 issue. 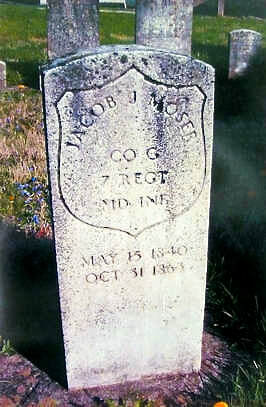 Tucked in a corner of the Mt Zion United Methodist Church Cemetery in Myersville, in the ell of the church is a military tombstone for Jacob Josiah Moser. He was born on May 15, 1840 to Elias and Susan Moser. In 1840, Jacob and his parents, along with two older siblings, Mary and Ezra, lived in District 3, in Frederick County. By 1850, the family had moved to the Catoctin District. According to the 1850 census, Jacob’s father Elias was a laborer with $600 in real property and there were four children in the family. By 1860, Elias was dead and Jacob’s mother Susan was head of the household. Elias passed away on April 24, 1857, at the age of 46 and was buried in the Mt. Zion Cemetery. The family of 1860 included Ezra, 23; Josiah, 19; Oliver, ten; and George W., seven. One of those wounded was Jacob J. Moser. He received three wounds in the October 20, skirmish. He died in Lincoln Hospital, Washington, D.C., on October 31 of “velnus sclopt” [sic – actually vulnus sclopet or gunshot wound] (U.S, Burial Register, Military Posts and National Cemeteries, 1862-1960). Moser spent eleven days suffering from his wounds before expiring. He was first buried in the Soldiers Home Cemetery, near Washington, and later exhumed and reburied in Myersville. His name appears as "Jacob Morse" in military burial records. "Saturday 2nd. -- Weather very cold. We started with the body of J. Moser this morning about daylight from Frederick, had a very cold ride of it. Arrived in Myersville about ten o’clock, deposited the body at Cyrus Routzahn’s, and then went to Joseph Brown’s to the sale where Grandfather’s Land was sold, afterwards had the grave dug and made arrangements to have J. Moser buried tomorrow afternoon." Jonas Warrenfeltz, married to Jacob Josiah Moser’s sister Mary, was appointed administrator of the personal estate of Josiah Moser on December 25, 1863, in Frederick Co., MD. According to the History and Roster of Maryland Volunteers, War of 1861-1865, Vol. 1, pp.293-294, others of Co. G from the Myersville/Middletown area who died during the war included: Mahlon Ambrose, Peter Biser, Lawson Boyer, Peter H. Ifert and David Franklin Palmer. Mahlon Ambrose died of disease and is buried in St. John’s Lutheran Church Cemetery at Church Hill. Peter H. Ifert died of disease in August 1863 at Rappahannock Station, VA, and is buried there. Lawson Boyer was apparently injured about the same time as Jacob Josiah Moser; he died November 3, 1863, in Lincoln Hospital, Washington, D.C., from a gunshot wound, and was buried November 4, 1863, in the Soldiers Home Cemetery there. There is no record that he was brought to Myersville for reburial. Peter Biser died of wounds received in action May 5, 1864, in the Battle of the Wilderness, VA. He was apparently buried in Virginia, as no Frederick County record of his burial has been located. next to Jacob Josiah Moser in the Mt. Zion Cemetery. This story first appeared in the Middletown Valley Citizen on September 7, 2017. Fonda Gormer writes from Wolfsville where she does research on local genealogy and history. She also does research for the Myersville-Wolfsville Area Historical Society. During the Civil War, Koogle served as a first lieutenant in Company G, 7th Maryland Infantry. He received the Medal of Honor for capturing the flag at the Battle of Five Forks, Virginia, on 1 April, 1865. The Medal was bestowed on him a little over a month later, on 10 May. Koogle was later promoted to captain. Jacob Koogle was born December 5, 1841 at Myersville, Maryland. The 1860 census lists him as a farmer. One of nine children of Adam and Magdalena Koogle residing in Frederick County, He was 5' 8" tall with a fair complexion, sandy hair and grey eyes. At age 20, on 13 August, 1862, at Middletown, he enlisted as a private in Company G, 7th Maryland Infantry Regiment. Most of the line officers and men were substantial farmers, mechanics, and laborers from the rural districts. This regiment was recruited from the northern line of Maryland counties, under the call of 1 July, 1862, for "three years or the war." To read more of this article about Koogle and an honor ceremony held at his grave in 2009, click here. Hagerstown Daily Mail, Monday 8 May, 1950. ​John Leatherman was born on a farm near Harmony, a small village which is in turn near Myersville, on December 15, 1852. He was just ten years old when the Civil War was seeing its first real bloodshed in the Maryland campaign of 1862. Particularly vivid for him is the recollection of the morning in September of that year, when the Confederate troops marched past his home on their way to Middletown the same day found a larger Union detachment in hot pursuit of the Rebels, and that night Northern troops decided to camp in the six-mile area between Middletown and Harmony, on the eve of the Battle of South Mountain. "We were Unionists, of course," says John Leatherman today, "so naturally we were glad to see the Federal troops, and Father more than welcomed them to the use of his fields. We had wondered at the Confederates passing through so hastily and not even offering to steal our horses, but as we found out later they didn't have time to stop for anything. I remember that evening, the thirteenth, an orderly of one of the Union officers came up to up to the house and asked if he could buy some bread, butter, and other foodstuffs for the officers. Mother said they were welcome to all she could spare, of course. She was down to the springhouse getting things together for the fellow when an enlisted man walked up swinging a stick. He asked if she could spare from food, too, and she said she was sorry but that she had already given all the food she could spare. The soldier kept standing therein the spring house, eying the three big, round loaves of bread that she had laid out on the bench for the orderly, and I was pretty sure I knew what was in his mind. When Mother took the orderly back in the milk house to get some butter, the soldier suddenly jabs that stick into one loaf, then another, then the last one--and scooted out the door. I didn't say anything, of course. When Mother came and discovered the bread gone and he was already hot-footing it down through the meadow." Three officers asked to use the Leathermans' spare room that night so they might a decent night's sleep. They were welcomed, of course, and young John went to bed thinking how safe and secure it seemed with real, live soldiers in the house--and all around the house! There were soldiers as far as he could see at dusk from Harmony to Middletown. But when John arose the next morning, September 14th, there wasn't a soldier in sight. Someone had come after the three officers in the middle of the night because of a hasty change of strategy. By six in the morning, Union and Confederate forces were already in a pitched battle on South Mountain. Young John sat fascinated all day, watching the trajectories of shells above the trees of the mountain, followed by the little puffs of smoke that marked their targets. The battle raged all that day and, two days later, continued at the illustrious Battle of Antietam--turning point of the Civil War. John Leatherman recalls how his father and a neighbor by the name of Buzzard went up on South Mountain on the fifteenth, with shovels and picks, to bury the dead. He was told he was too small to go along, which hurt him deeply, but he wasn't too small to go with his mother to the Lutheran church in Middletown to take food to the wounded. Every bench in the church was being used as a bed, with wounded men writhing in pain and crying out for help. "I'll never forget that one poor man," says Leatherman, "lying there with just a stump sticking up where his one leg had been. I can still see his eyes today, the tragic way he looked up at me." Some of Leatherman's favorite recollections are those that deal with the Blessing family, nearby neighbors. Later in the war, when the whole countryside was being plundered by wandering bands of Rebels: "Boy, that ol' George Blessing was a spunky one," says Leatherman. "Those Rebels were trying to get a hold of all the horses they could. When Father heard about it, he took his horses up into Pennsylvania. Not George Blessing--he just stood pat on his own farm there. When two Confederate soldiers showed up to search for his horses, he ordered them off of he'd shoot. They laughed at him--and he shot. He just wounded the one and the other high-tailed it. He didn't mean them no harm, though--he was a God-fearing man and peaceful, but he just didn't intend to let anyone take advantage of him. He took that wounded soldier up in the haymow of the barn and nursed him along, just as if he had been a Union man. "Those Rebels sent ten men the next time, figuring they could scare him. Ol' George shouts a warning to them and they kept on coming, so he shouts again--and kills their leader dead on the spot. They left but they were coming back for sure then. It had gotten to be a matter of principle with them. They practically surrounded his farm with artillery then sent him a note to give up. He sent them a message back telling them to fire away--that they'd be killing their own buddy in the barn. He couldn't have held out indefinitely, of course, but luckily a special detachment of Union soldiers came to the rescue the next day, and drove the Rebels out of that community." George Blessing was a hero of Young John's, even though he himself refused to be called a hero. He wasn't proud of having killed a rebel officer and the morning after the Union soldiers came to his defense, he gathered them all on the lawn before his house--and read aloud to them the 91st Psalm. He saw to it, too, that the man he had killed received a decent burial. And through all of this, George Blessing had been alone on his farm except for one daughter, aged eighteen--all the rest of the family having deserted him. 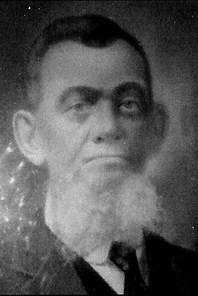 "That George Blessing," says Leatherman, "was one of the hottest Abolitionists I ever did see. The funny thing though, was that he had some slaves on his farm. He had married an Easterday girl from down around Jefferson and she had inherited some slaves. They weren't treated like slaves in that day--they were treated like humans. And ol' George freed them before the war started, long before the Emancipation Proclamation, and told them they could go their ways. 'Nary a one left the place, though. Every one of [them] stayed on until the day [they] died, and the Blessings buried them all eventually in a corner of St. John's Lutheran church yard, on Church Hill, about two miles from Myersville." Read a full article on Leatherman here. "The Grossnickles were strong Union sympathizers…. In 1862, during the Battle of South Mountain, the cannon shots could be distinctly heard from the Grossnickle home. The hills intervening prevented seeing any smoke of battle, but each of time the cannon shots were heard, his mother and the other women present would cry. They knew that it meant death to the soldier boys. "In 1863, when Lee’s men were on their way to Gettysburg, the sound of marching feet were heard along the rippling Catoctin. The soldiers, he said, marched two by two. They came by the Grossnickle Church [of the Brethren] but did not disturb it in any way. Neither did they bother any of the farm buildings. As they traveled, they were looking for horses. They looked over the Grossnickle’s horses, rejecting one in the field that was not up to their standards, taking the three good ones. When Upton’s father pleaded with them not to take his horses, the officer replied, ‘I will be tied to a stake and shot if I do not take them.’ There was nothing more to do but watch them leave. "The soldiers were hungry and Upton’s mother baked bread and pies for them…. One of the Confederate soldiers, or ‘Rebels,’ as Upton called them, complained about not having a hat. ‘My father took the straw hat off my head and gave it to the boy. I do not know whether I had been fighting bees or not, but [I] had knocked the crown out of the hat. The soldier boy took it off his head, turned it over, and remarked, ‘This one doesn’t have any bottom in it.'" Valley Register, 15 March, 1861. This breakdown of 1860 Census information reveals that in the Jackson District of Frederick County, No. 16, which included Myersville, Jerusalem, Harmony, and other small settlements, that only 35 African-Americans were counted, and none of them were enslaved. The only other district with no slaves was No. 10, Hauvers. District No. 6, Catoctin, which included Wolfsville, had three slaves and one free black reported. Valley Register, 26 July, 1861. A list of 1860 Census results for each Maryland county of free and slave; also includes the total number of slaves in 1850 and 1860 in the state. In 1860, in all of Frederick County, there were 3,248 slaves, or 7.4 percent of the population. Public Meeting in Myersville -- Pursuant to notice, a large and enthusiastic meeting composed of voters Jackson District, Frederick County, MD, of all political parties, was held at the schoolhouse in Myersville on the 12th instant. An organization was effected by calling George Leatherman to the Chair, while Messrs. Jacob Smith of M., Jacob Young of D, and John W. Bussard acted as vice presidents. Charles F. Homerick was appointed secretary. Upton Burhman, Esq., assured the meeting in a thrilling and effective address showing the conservative position, Maryland as a border state should occupy and maintain against the assaults of the Secessionists at the South or the Republican fanatics of the North. He urged upon all men to lay their party differences aside and to come up boldly in an unbroken phalanx and defend the Constitution and the Union. A Dirty Act -- Some despicable traitor on last Friday night cut down a Liberty Pole in Myersville, which had been erected that day previous by the Union men of that place. On the following day, however, the loyal citizens rallied and erected another, still higher than the first, from which now floats the Stars and Stripes. If an attempt is made to fell this one we hope the perpetrator may be detected and receive summary punishment. A Liberty Pole is a tall wooden pole, often used as a type of flagstaff, planted in the ground, and surmounted by a red Phrygian cap. During the American Revolution, Liberty Poles were raised all over the colonies, and the tradition was renewed during the Civil War. Myersville's Liberty Pole may have included the red Phygian cap, the Stars and Stripes, and other banners and long ribbons painted with patriotic slogans. Below: Two 18th Century Liberty Poles. More Companies Forming -- A meeting is to be held in this place [Middletown] on tomorrow evening, and in Myersville next wednesday evening, for the purpose of forming a Cavalry Company. We hope the effort will be successful. We learn also that the citizens in the neighborhood of Huffer's School House, 2 miles south of town, are forming a Home Guard. ​Large Union Meeting --Pursuant to public notice, a large and very respectable number of the inhabitants of Jackson District, Frederick County, MD, met in Myersville on Saturday, the 11th inst. This meeting was composed of men of all the former political parties, viz. of Breckinridge and Douglas Democrats, of Americans and old-line Whigs. The meeting was organized by appointing William Metzger, Esq., as President; David Morgan and Jacob Smith of M, as Vice Presidents, and Wm. R. young as secretary. This meeting was one of a peculiar character. The people convened with a full knowledge of the dangerous condition of their country. Many of them, who heretofore merely looked on and were quiet, see now where the present legislature in convention in Frederick endeavors to lead them or force them, have become aroused and feel they must come up to a man in the discharge of their duties. They see that their property, their lives, and their all, is at stake. You could see a death-like solemnity depicted on the countenances of every man. Seizure of Arms -- About noon on Monday last a detachment of 30 men from companies B and F of the 4th Connecticut Regiment passed through this place from Myersville in this valley, having in charge a number of State Rifles, found in the possession of Capt. Aaron Poffenberger, of that village, whom they had previously placed under arrest. The Examiner says: "The information against Captain Poffenberger was that he had, by handbill, recently called in these riffles from the possession of persons belonging to a company he commanded from 1845 to 1848, and that he was in the habit of drilling a number of his partisan friends in the use of this deadly arm. He denied that he was a Secession sympathizer and declared himself a Union man. He was then asked to surrender then and promptly complied by giving up 4 stand; whereupon he he was released from arrest. The rifles have been given one of the companies of the 'Home Brigade' for guard duty." Note: The scanned image of the original newspaper is not reproducible. Denial – We have received a note from Capt. Aaron Poffenberger, from whose possession a seizure of 41 minie rifles was recently made at Myersville, denying that “he was in the habit of drilling a number of his partisan friends in the use of this deadly __,” as we had been informed. We cheerfully give the Capt. the benefit of his denial, and are glad to learn his __; that he had placed the weapons in the hands of a good Union man instead. The other facts stated in this connection last week, are admitted to have been correct. Left: The circa-1790 tavern at 203 Main Street, Myersville, owned by Capt. Poffenberger in 1861. It was razed circa 1905 for a house built by John Caleb Leatherman. Seizure of Arms -- On Monday morning a detachment of thirty men from companies B and F of the Fourth Connecticut regiment, proceeded to Myersville, Frederick county, and arrested Capt. Aaron Poffenberger on the charge of having a number of State rifles in his possession, supposed to be intended for disloyal uses. The arms were given up and Capt. P. released. Pole Raising -- The Unionists in the neighborhood of Koogle's School House, one mile south of Myersville, erected a beautiful Liberty Pole on saturday last, and flung to the breeze therefrom the glorious Stars and Stripes. Baltimore Sun, 12 September, 1862. He reached a position on the mountain over-looking Frederick, and by means of a glass saw all that was going on in town. He arrived there about 11 o'clock this morning. He says there was evidently movement of troops in the direction of Middletown and Boonsboro going on. Farmers informed him that forward movement began at 3 o'clock this morning. The force was supposed to be about 20,000. The messenger then crossed the mountain to within two miles east of Myersville, and reached a position overlooking Boonsboro. He saw three regiments of infantry, one of cavalry, eighteen cannon and a large number of wagons. The soldiers looked rough, ragged, shoeless, and almost hatless. A mail carrier was taken prisoner and held for five hours. He says that numbers of the rebels threw themselves down in the middle of the road, being attacked with bilious colic, caused by eating green corn. Baltimore Sun, 3 January, 1863. Outrages and Robberies by Deserters -- On Friday night of last week, three desperadoes supposed to be deserters from the Federal army, crossed through Middletown Valley, committing a series of desperate robberies, and calling at a number of houses in quest of plunder. Among others they obtained through threats of violence three suits of clothing and five dollars in money at Mr. Jonathan Routzahn's; at Mr. Mayn's, whose son belonging to a Maryland regiment, was at home at the time, they said they belonged to they belonged to the 14th Pennsylvania cavalry; at Mr. Henry Crone's they demanded money, but got only a saddle; they next met Mr. Adam Koogle, living near the Burnt bridge, and with drawn revolvers, demanded to know if there were any men in his house; he replied there were any men in the house; he replied that there were six or eight, and asked them to go in with them; they declined, but said they were in pursuit of a "seceah" and wanted a common riding saddle instead of their own, to perfect the disguise -- they got it and rode off. At the house of Mr. Daniel Miller they were confronted by a young girl, who boldly denounced them upon their demand for money; but they broke open the door and repeated the demand, when Mr. M told them he had none and offered that they might search the house; they contented themselves with taking a new bridle, throwing their cavalry bridle away. From Mr. J. D. Koogle they extorted $26 by representing themselves as belonging to White's guerillas. In this manner, they proceeded through the valley, but the alarm being given, they were pursued by Messrs W. H. Miller and S. R. Stevens, who overtook and arrested them about two miles beyond Waynesboro in Pennsylvania. Being brought before justice of the peace, they gave their names as George E. Howard, John Scoogle, and another which our informant could not recollect , but these we presume, were fictitious names. They some forty-six dollars in maryland money about them, which was doubtless a portion of their plunder, and two of their horses bore the government mark; they other was probably stolen. They were fully committed to the Chambersburg jail to awat the requisition of the Governor of Maryland. A Lively Time -- Many of the scenes of last fall are again being witnessed in this portion of Maryland, in the activity that belongs to the presence of a great army in pursuit of flying enemy. The defeat and subsequent retreat of the impudent Rebel Army, which so recently invaded Pennsylvania and maryland, has again caused our beautiful valley to be overrun with soldiers, this route bein the nearest by which Gen. Meade could hope to intercept them. The movement of the troops through this place to the Upper Potomac commenced last Saturday evening, when a brigade of Gen. French's division commanded by Gen Morris, passed through and took possession of all the gaps of South Mountain. On Monday morning, Gen. Buford's cavalry, 5,000 strong, with an abundance of artillery, passed through and on Tuesday evening, the main body of the army began to arrive and push forward, and have so continued night and day, up to the time of our going to press. The veteran soldiers, though travel-worn and battle-scarred, are yet bouyant and enthusiastic, and move with vigor and renewed courge, in the hope of intercepting Lee's flying and demoralized troops. Gen Couch has also pushed forward with all his effective forces to ...??... to with and join the Army of the Potomac. His advance is already reported to have come in contact with the retreating enemy. Gen. Meade established his headquarters in this place [Middletown] last Wednesday morning, and remained until yesterday noon. There is an almost total suspension of business here. The stores even, having disposed of every article called for by the soldiers, are closed. Amidst all the bustle and excitement we have issued our paper, but not without much hindrance. Attempt to Seize a Ballot Box -- In conformity with the settled policy of Rebel communities, that might makes right, the Copperheads in Jackson District made a desperate attempt to seize the ballot box on election day, in Myersville, the place of voting, and would probably have succeeded in their nefarious work, had not the Judges closed the polls in time to prevent the outrage. Information of the lawless proceedings was immediately transmitted to Capt. Whittier, Provost marshall, by the election Judges, when he despatched a squad of soldier to the infected to quell the disturbance and arrest the rioters. On Thursday morning, the Provost Guard returned having in charge the following persons, all of whom were hastily released by order of Colonel Wm. P. Maulsby, commanding 1st Regiment PHB, an efficient body of loyal men: Jacob Summers of J, Samuel Wiseman, Enoch Wiseman, Daniel Palmer, Hezekiah Poffinberger, Cornelious Brown, Luther Palmer, Jonas Scoger, Daniel Michael and son. Upon the unwarrantable release of the above parties, several of them were rearrested by the civilian authorities and required to give bail for their appearance at the next term of Court. Other arrests, we understand, will be made and the offenders made to feel the extreme penalties of a grossly violated law. The Copperheads at Wolfsville also conducted themselves in a very disorderly and riotous manner, compelling Judges to receive their ballots without administering the oath required by the Convention Bill. A few "Yankees" in that quarter at our next election would be well. Passengers who came down from Hagerstown to Frederick yesterday state that when passing through Middletown Valley at eleven o'clock a.m., continuous cannonading could be heard in the direction of Berryville from the point where Sheridan was engaged with Early. The stage passed quite a number of panic-stricken farmers in the valley, who were running off their horses for fear that the rebels might Succeed in getting across the river. The subsequent news that Sheridan had beaten Early badly, driving him through Winchester, reassured the farmers, who took the back track homeward with their cattle. The news of the surrender of Gen. Lee's Army to General Grant was received in this place [Middletown] with a great spirit of rejoicing. The bells were again rung, and at night Young America built bonfires and sent up blazing rockets. The rejoicings of the people over this important event have been very general, and highly enthusiastic. At 12 o'clock yesterday a salute of 200 guns was fired by Frederick City from a Battery sent there from Harper's Ferry for that purpose by General Stevenson, and the city was illuminated last night in honor of the event. Our neighbors at Myersville also manifested their enthusiasm by an illumination last night, a procession, and suitable demonstrations of joy. Arrest of Blatant Rebel Sympathizer -- Mr. William Shank, a resident of Jackson District, was arrested last week and taken before the Provost Marshal in Frederick on the charge, we learn, of expressing his pleasure at the assassination of President Lincoln, and insulting the American flag. Shank was subsequently sent to Harper's Ferry and placed in the hands of the military commandant at that post. William Shank (1825-1903) was a Myersville-area cooper. He is buried in St. Paul's Lutheran Church Cemetery with his wife, Susan. Soldiers' Pic-Nics – The loyal citizens of Mechanicstown District intend giving a grand pic-nic in honor of the returned Union soldiers, on Thursday, the 29th inst. Every needful preparation is being made to render the occasion pleasant and agreeable. Emulating their praiseworthy example, the citizens of Urbana District contemplate treating the returned veterans of said district by a smaller entertainment on Friday the 14th inst. A cordial invitation is extended to all the friends of the soldiers. The Union Ladies of Jefferson and Jackson districts also intend honoring the returned union soldiers of said districts by giving them a pic-nic on Thursday the 20th inst. No pains will be spared by the ladies to make the approaching festival a source of enjoyment to all who may attend. See advertisements in another column. Sunday School Pic-Nic -- Last Friday the Union Sunday School of Myersville, in this county, held a pic-nic in honor of returned Union soldiers, which attracted a goodly number of those stern defenders of their country. They were treated to a most sumptuous entertainment and the occasion will long be remembered by those participating. Pole Raising at Beallsville [Harmony] -- On Saturday last, the Conservative men of old Jackson and the surrounding districts met together at Beallsville to hold a Johnson meeting and erect a pole. Delegation from Washington Co. were also present. The assemblage was one of the largest and most enthusiastic ever convened in that part of the county. The pole raised was the tallest ever seen in this section of the state. It's height is 165 feet! The first splice ws from a mammoth hickory and was 57 feet in height. There was speaking throughout the afternoon and night to a late hour, the interest of the audience never flagging. The Mountain men are determined to maintain their rights and uphold the President in his effort to save the Constitution and the Union at all and every hazard! Mrs. Catharine Boyer of Highland, this county, is visiting her daughter, Mrs. R. A. Rager, this city. Mrs. Boyer is the daughter of the late George Blesing, who so successfully defended his property during the war against a party of Confederate calvary that attempted to drive off his horses, which resulted to them in the killing of several of the foraging party and the wounding of others. Mrs. Boyer was an eye witness to the engagement and speaks of it as one of the most remarkable and sanguinary incidents occurring the neighborhood during the war. Baltimore Sun, 23 May, 1892. Luther Warrenfeltz unearthed last week while ploughing on his [Wolfsville] farm, a mile north of Mrs. Dahlgreen's place, seven skeletons of soldiers who fell in the South Mountain battle and were buried very tightly near each other. Fourteen bullets were found with the remains, some imbedded in the skulls. It is supposed the bones were the remains of Confederate soldiers. A meeting of Union Soldiers was held at Myersville last Saturday night with the view of organizing a Grand Army Post at that place. Capt. Jacob Koogle was chosen President, and Mr. Daniel H. Bowen was appointed a committee of one to work up the the matter.